FirstService Residential, the leading HOA management company in Nevada, has been selected to provide community management services for The Falls at Rhodes Ranch Condominium Owners Association, Inc.
Our management team is comprised of experienced professionals who are committed to ensuring that the transition of The Falls at Rhodes Ranch is a seamless process for the board and residents. 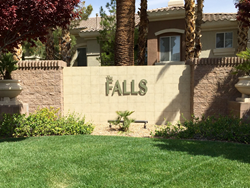 FirstService Residential, the leading HOA management company in Nevada, has been selected to provide community management services for The Falls at Rhodes Ranch Condominium Owners Association, Inc. The community is located in Las Vegas and consists of 360 condominium units. FirstService Residential assumed management responsibilities on July 1, 2016. The Falls at Rhodes Ranch is located off of Warm Springs Road and El Capitan Way. The gated community offers its residents numerous amenities including three pools and a spa, a clubhouse with a fitness center, party and meeting facilities, and a playground area. FirstService Residential is recognized as Nevada’s leading and most experienced full-service community association management firm. For over 25 years, FirstService Residential has continued to provide the best-in-class community management solutions and genuinely helpful service to its over 370 properties and communities throughout Nevada.